SENEX -A Chart of the Coast of Cormandel and the great Bay of B..
SENEX,J. - A Chart of the Coast of Cormandel and the great Bay of B..
A Chart of the Coast of Cormandel and the great Bay of B.. - SENEX,J. Date : London, ca. 1728. Size : 22.3 x 18.9 inches. / 56.6 x 48.0 cm. 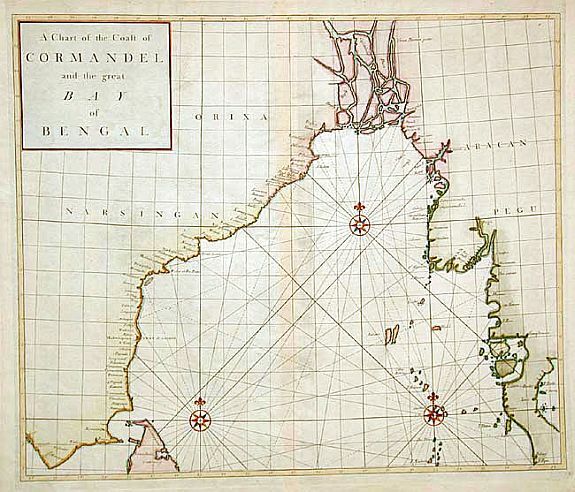 Description :A nicely engraved sea chart of the eastern coast of India, Burma's west coast and the island of Andaman. The map makes use of the new projection by Dr. Edmond Halley. Nicely decorated with three compass roses. Condition : Faint toning along centerfold. Overall, very good to near excellent condition.